Today marks the last day off for the all star break and the past couple days we have handed out midterm grades to the Phillies infielders and their pitchers. Today, on the final day of the break for the Phillies, we finish up by assessing the outfielders. Things have been pretty stable in the outfield as the Phillies sent their entire starting outfield to St. Louis for the all star game. The backups are not bad either. Ibanez has done his part, though, to win over the fans in a way no other Philadelphia free agent athlete has ever done before. Ibanez has played like an MVP through the first half of the season and despite missing twenty games due to injury, he still finds himself among the team leaders in a number of categories. Now that he is back the question remains as to whether or not he will have as much of an impact on offense. His defense and base running has been somewhat of a surprise to most fans as well, making most everyone forget about Burrell. If he continues to play this well the Phillies can put themselves back at the top of the National League by the end of the regular season. Ibanez was voted to be a starter in his first career all-star game. Shane Victorino has been more of a spark plug at the top of the batting lineup this season as Jimmy Rollins had gone through some struggles. Because Rollins's production had been down for a long time one can only imagine where Victorino's RBI total would be with an effective Rollins. Victorino not only gets the job done on the base paths (15 stolen bases, caught stealing five times) but he also continues to excel in the field. Coming off of his first Gold Glove award in 2008, Victorino is making a case for a repeat in 2009. His .995 fielding percentage is among the leaders in the league. Victorino also was selected to his first all-star game by winning the Final Vote. Jayson Werth has quietly had a nice season, worthy of making his first all star game as well. Werth is just four home runs shy of his career high and is on pace for a career high in total hits. He is also just eleven runs batted in shy of another career high. Werth is also showing more patience at the plate it seems as he is five walks shy of his career high. When he gets on base he can be dangerous as he has 12 stolen bases, including one successful steal of home against the Dodgers. Werth's defense has been solid as well. He has been charged with a pair of errors but has been a part of one double play and has picked up seven outfield assists. Opposing base runners know they can not sleep on Werth as he also has shown the ability to throw a runner out at first base in the right situations. The young John Mayberry Jr. had a wonderful debut in New York against the Yankees, but since then he has been quiet. Mayberry has struck out 19 times, picking up some at bats with the absence of Ibanez. Mayberry may in fact not be major league ready at this time but the Phillies are lacking right handed options on offense. The Phillies have had little choice but to keep Mayberry up in Philadelphia rather than playing every day at triple A Lehigh Valley. You do not want to be too hard on the rookie as his playing time is scarce, but unless he can get some more hits (and not necessarily home runs), Mayberry has been poor. Matt Stairs has taken over the role of best pinch hitter from Greg Dobbs. The folk hero provides the Phillies with a true professional hitter in a pinch hit situation and he is not afraid to swing and take pitches. It is rare to find a player who can be both patient and swing happy. Stairs has picked up four home runs this season and has been used mostly as a pinch hitter late in games when the Phillies need a big hit. Stairs delivers clutch hits but he also provides clutch walks that extend rallies. For his role on this team, Stairs has done a fine job. The outfielders have probably been the most consistent area of the team. The infield may be the core of this Phillies team but the outfield to this point has been the better unit. Three players from the outfield went to the all star game and two of them started, although Victorino was a fill in for an injured player in the starting lineup. 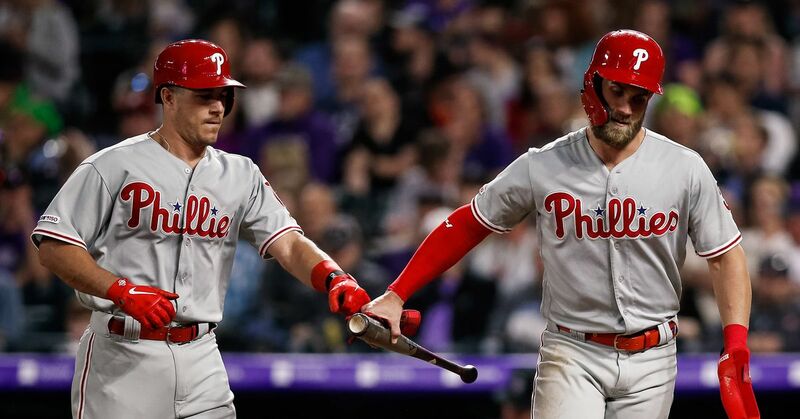 The defense is as good as it has been in years in all three parts of the outfield and the offense may be the best out of an outfield unit the Phillies have seen in years. So what are your thoughts on the Phillies outfielders? Are these grades too high or too low (doubt that)? What do you expect to see in the second half of the season?